For the past 30 years, popular opinion about where in space humans should go next has swayed between a new mission to the Red Planet and a return to the Moon. Considering the smorgasbord of problems we've made for ourselves on planet Earth, from ecological to economic, such goals of exploration and colonisation can have an egoistic, even selfish, root - we may need to find a new home due to the aforementioned problems and a litany of unmentioned ones. However, even the most optimistic colonisation estimates are measured in decades, and there's no guarantee that we'll survive the rest of this century, let alone long enough to effectively expand humanity throughout the galaxy. But what if, right now, we could start the process of seeding life on other worlds? Humanity may not survive, but some form of life could. Claudius Gros, theoretical physicist at Goethe University in Frankfurt, Germany, thinks we should consider it. He believes seeding life throughout the cosmos takes precedence over human colonisation, and he also believes this process of intentionally seeding other planets in the universe with life, more succinctly known as deliberate panspermia, is within our technological capability. Breakthrough Starshot is an ambitious plan to send the first probe ever to Alpha Centauri, our nearest neighbouring star after the Sun, using a laser propulsion system. That trip is expected to take about 20 years and will require that a probe weighing just one gram be accelerated to a speed of 160 million kmh (100 million mph), or one-fifth the speed of light. The probe won't have a braking system and is expected to whizz by the star hours after reaching it, just enough time to take pictures to transmit back to Earth. In a recent study published in Journal of Physics Communications, Gros proposes that we use the same laser propulsion system to send a 1.5-ton spacecraft at slower speeds so we can do more than just take pictures. He wants to achieve a stable exoplanet orbit and seed other worlds with life via onboard "mini labs" that would grow genes and cells. The stated objective is TRAPPIST-1, but other exoplanets, such as the recently discovered Ross 128b, are also under consideration. Gros's hypothetical 1.5-ton spacecraft for seeding life would launch from Earth, and huge, Earth-based lasers directed at the probe's 50-kilometre-wide (31-mile-wide) light sail would propel it to roughly 30 percent of the speed of light for part of its journey. 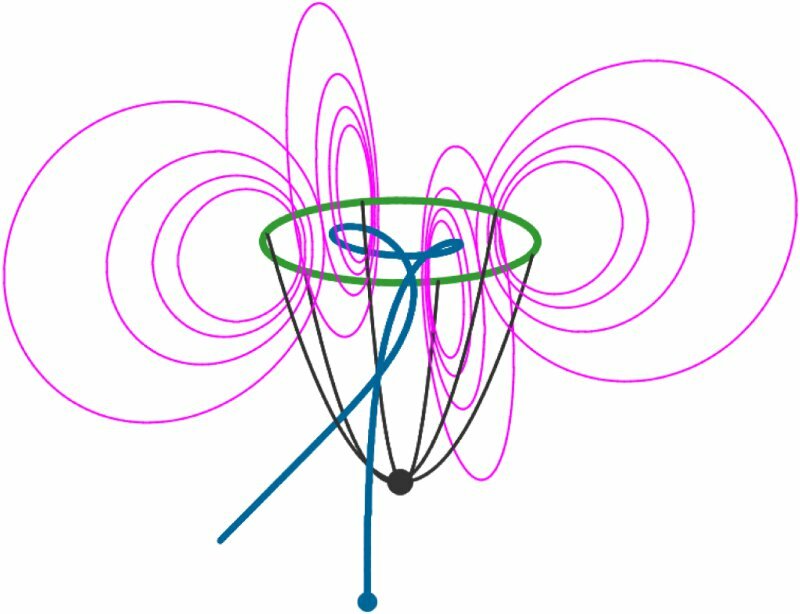 Unlike the tiny probe used for the Alpha Centauri mission, Gros's spacecraft would need to be able to stop once it reached its destination, though, so he devised a way to do so using a magnetic sail that would generate friction with protons. This will allow the craft to decelerate en route, much like letting a car coast to full stop on the highway. "The reason for the magnetic sail is to create a magnetic field without loss of energy," Gros told Futurism. "You don't want to expend energy, so you generate the field once, and then with a superconducting loop, the current stays forever, and the magnetic field stays forever." According to Gros, the magnetic sail would have a radius of roughly 50 kilometres (31 miles), and each of its loops would generate a magnetic field. These fields would shift the momentum of the probe to whatever particles it encountered. Essentially, the protons between the Earth and the probe's destination would create the friction it needed to decelerate. It may seem strange to imagine a giant probe being slowed down by something as small and insignificant as protons. Further complicating the situation is the fact that scientists suspect remnants of ancient supernovae may have swept gasses out of the space surrounding our Solar System and those near it, thereby lowering the density of matter. However, Gros explained that even with that lower concentration of matter, his design could provide the necessary friction to slow the hypothetical spacecraft enough to orbit, and not flyby, an exoplanet. "You can brake via friction from the interstellar medium," he said. The catch is that the added mass needed to provide deceleration puts a 12,000-year timeframe on his proposed journey to TRAPPIST-1. On a cosmic scale, that isn't even a blink of an eye, but since humans rarely live past 100, no one alive now would survive to see our probe for seeding life reach its destination. Recently, scientists have begun to theorise that the growing number of exoplanets discovered orbiting red dwarfs could have water and oxygen. These planets hadmuch longer periods of atmospheric cooling than Earth had, which could have prevented life from forming on them back when it first emerged on Earth. "It took the Sun 10 million years to cool to about today's temperature, but small stars, like TRAPPIST-1, remained hot for hundreds of millions of years," Gros said. Consequently, he explained, the water vapour within the stratosphere of the TRAPPIST-1 planets was dissociated by the ultraviolet radiation of the host star into hydrogen and oxygen. Hydrogen escapes into space, as it is too light to be retained by an Earth-like planet, and the oxygen left behind accumulates. "If some of the seven TRAPPIST-1 planets still have an ocean, they would also have a massive oxygen atmosphere. Earth's oxygen pressure is 0.2 bars, but on TRAPPIST-1-like planets, it could be 100 bar or more," said Gros. This excess oxygen "eats up" biotic life, preventing protocell formation. Complex eukaryotes, which form the basis for present-day multi-cellular life, would never have had a chance to develop on an "oxygen planet." "We could have millions or billions of habitable exoplanets, but sterilised by oxygen from the beginning," said Gros. Consequently, the common objection that we should avoid interfering with the natural evolution of alien life would fall away - we wouldn't be interfering with anything. The cosmic garden may await us, but the long transit time proposed by Gros may dissuade some from taking his seeding life project seriously. Even after the probe reached its destination, any life would take many billions of years to mature, Gros said. Gros' initiative for seeding life throughout the cosmos, dubbed the Genesis Project, forces us to step back and take a look at what we're doing on Earth. "If you are rational, you cannot argue a longterm project will have use on Earth, because no one will be around," Gros said. To Gros, his hypothetical mission ultimately forces humanity to consider a metaethical question. The most natural ethical system for our species is one that places us in the centre, and that's largely how we live. But do we need to follow this imperative 100 percent of the time? Gros doesn't think so. "An ethical system which is 99 percent humanity-centred is enough to build a thriving civilisation, with the remaining 1 percent allowing us to pursue 'non-rational' projects like the Genesis project," he told Futurism.